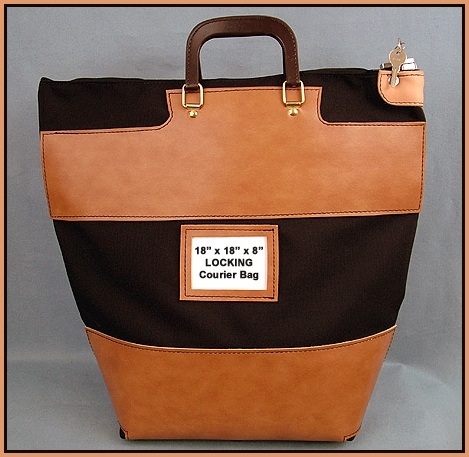 This is a HEAVY DUTY locking courier bag made for rugged usage! It is made from 1350 Denier gold color Ballistic Nylon and has 2 inch webbing handle/straps sewn on each side for carrying heavy loads if needed. 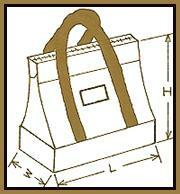 The bag comes stock with a 3-1/2 x 4-1/2 framed ID window, brass zipper and high security 6-pin pop-up locking system. Bag has 6 small plastic legs which allows it to stand vertical when placed on floor for easy loading. It has 88 gauge vinyl panels sewn completely around bottom and upper edges for extra protection and added strength. 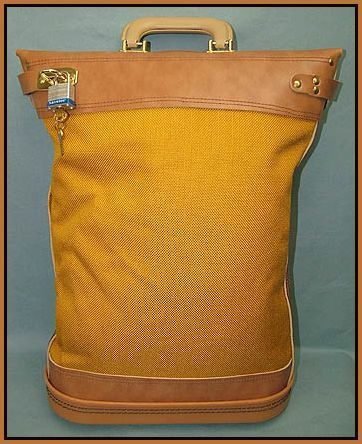 Bag shown here is 18"L x 18"H x 8"W which is one of the most popular. These bags can also be made from 1000 Denier Cordura in a variety of colors as well. 8" x 18" x 24"
5" x 16" x 20"
5" x 18" x 24"
5" x 18" x 30"
5" x 24" x 37"
<<< This locking transport bag is commonly used as a transport and mailbag. It also has the 6DPU high security locking system which has been used for years in night deposit bags. The stock bag is also made from 1350 denier nylon and has the framed card holder which is used for labeling and identification purposes. Bag shown here is 24 inches high by 18 inches long. This bag has briefcase style handles and super re-enforced bottom for superior strength. 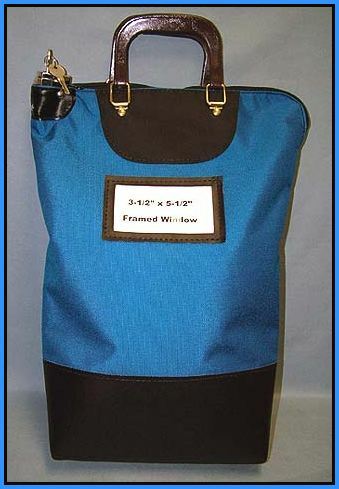 This bag, as well as all bags here can have larger framed windows if needed. Like all heavy duty bags on this page, it can be made in 1000 denier Cordura in various colors. Please contact us with any special needs. 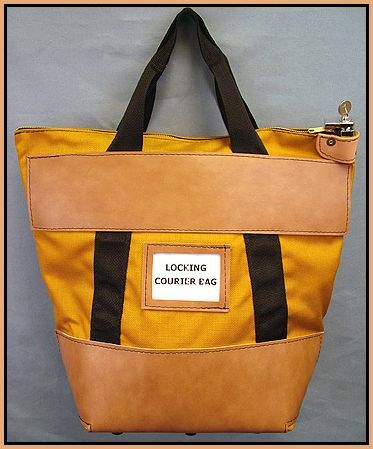 6" x 14" x 18"
6" x 18" x 24"
This ECC style of locking courier-transport bag is an ideal choice where budget may be a concern. It is our economy line of bags but still maintains the quality throughout! The biggest difference is the bottom of the bag. Instead of a "hard-molded" bottom, it has soft durable vinyl covering bottom portion of the bag. These bags are made from 1000 denier Cordura and can be made in all the colors above. We can make this bag in any custom size you may need. 4" x 12" x 16" - 4" x 8"
4" x 14" x 18" - 4" x 10"
6" x 18" x 24" - 6" x 12"
Please Call For PRICING !!! 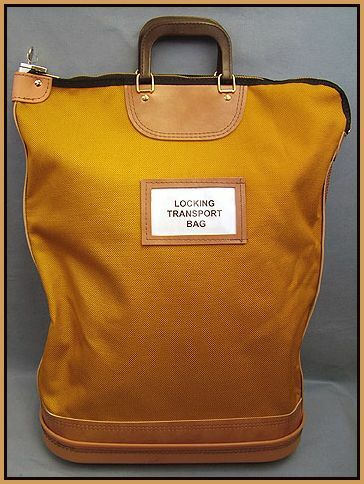 This LCB-818 bag is very similar to our HDLCB bag above with the exception of handles instead of straps. The strong molded plastic handles allow it it be carried like a briefcase. This bag is built tough yet has a fashionable flare about it. It has small button type legs on the bottom which allows it to stand on its own. This can make filling a bag with items an easier task. 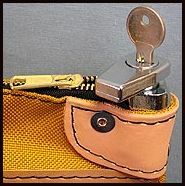 Bag shown here has a 6 pin pop-up lock, which is by far the most popular! The bag can be made in many colors and custom sizes as well. Please inquire with ANY special requests.